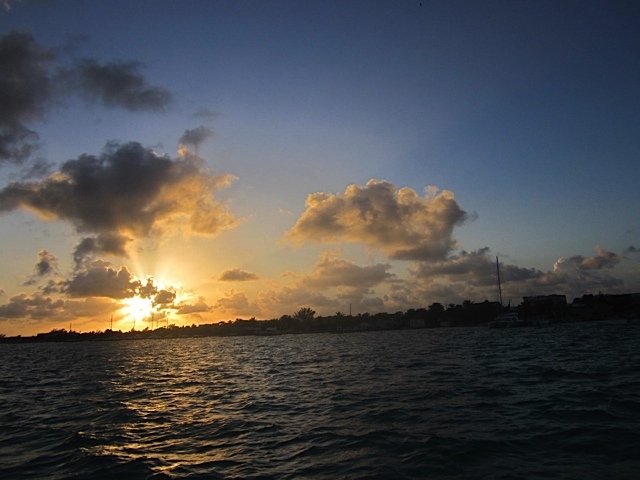 There is only one reason we chose Ambergris Caye as our current global home base: The Water. 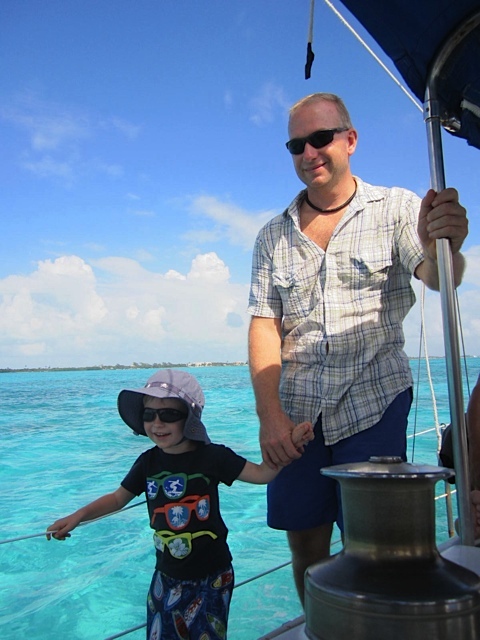 Our reason for moving here was so simple we didn’t have to think about it very long: we wanted to play on white sand and swim in crystal clear water with great marine life. That’s it. That was our reason. 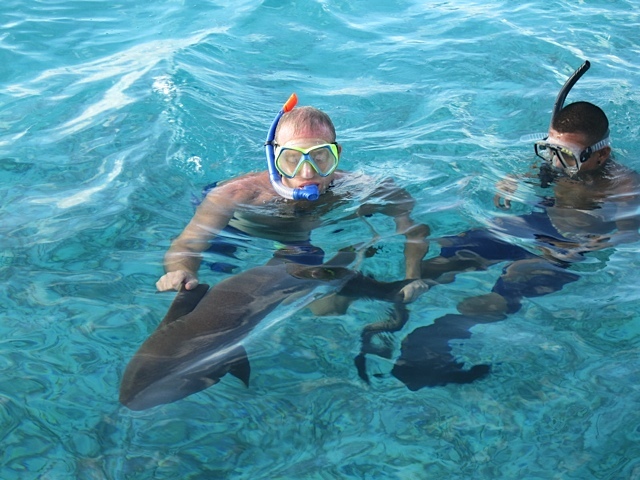 A few weeks ago we were able to enjoy the beautiful Caribbean waters with a full day of snorkeling, swimming with sharks (yes, sharks! ), and eating fresh seafood. 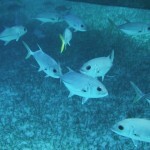 The visibility in this part of the ocean can be up to 300 feet, making diving and snorkeling awe-inspiring. 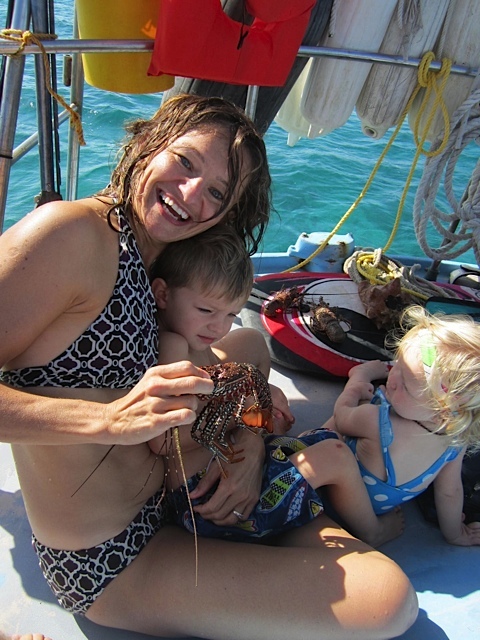 We went on a full day snorkeling excursion, stopping at four great snorkeling spots with a delicious, fresh fish lunch on the boat. 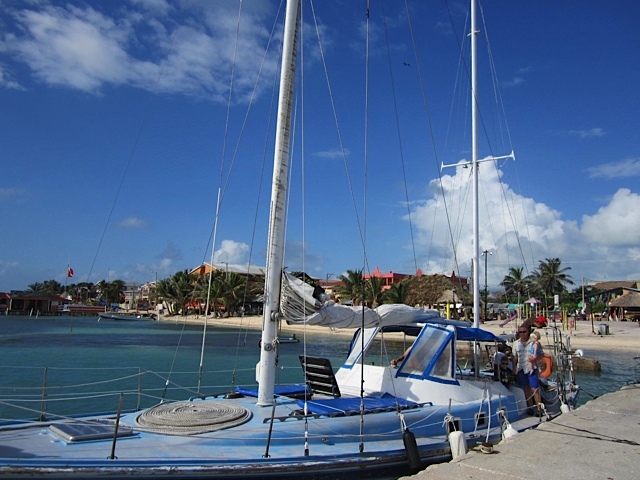 We were picked up in a golf cart at 9 am by our tour operator and driven to the dock where our boat and 4 other snorkelers were waiting for us. It was nice to have a small group. Five minutes sailing out onto the ocean and I think I said “Wow, look at the color of that water!” about twenty times. I was starting to sound like a broken record, but I couldn’t help it. The azure water is mesmerizing. It’s the kind of water that you only see on postcards. Belize has the second largest barrier reef in the world, and from the small part that we were able to see, it was amazing. 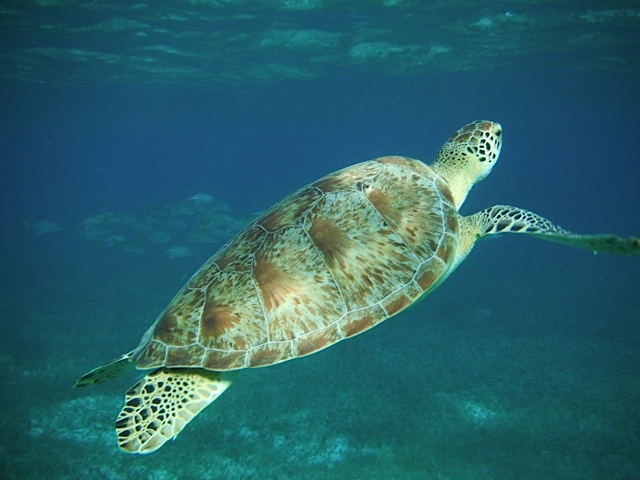 The reef is only a few hundred meters away from the shores of Ambergris Caye. From our condo, we see the waves breaking over it every day so we were really excited to finally go there. 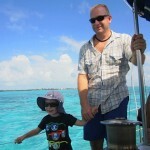 Our first stop was the Coral Gardens near Caye Caulker. 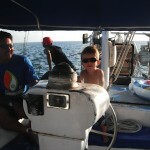 We strapped on our snorkeling equipment and since Isla was sleeping, we left her on the boat with Luis, our captain. The three of us jumped into the water. K and S swimming pulling G in his boat floaty. The current was strong and it took a lot of effort to swim against it. My fin kept falling off and after 30 minutes of getting nowhere, I gave up and swam back to the boat, towing G. K went on to meet up with our group and said he saw lots of beautiful, colorful fish. Good for him, bad for me. Our next stop I was able to snorkel with the group while K stayed on the boat with kids. 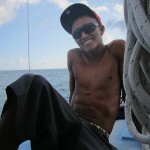 We watched our guide, Giovanni, spear fish. 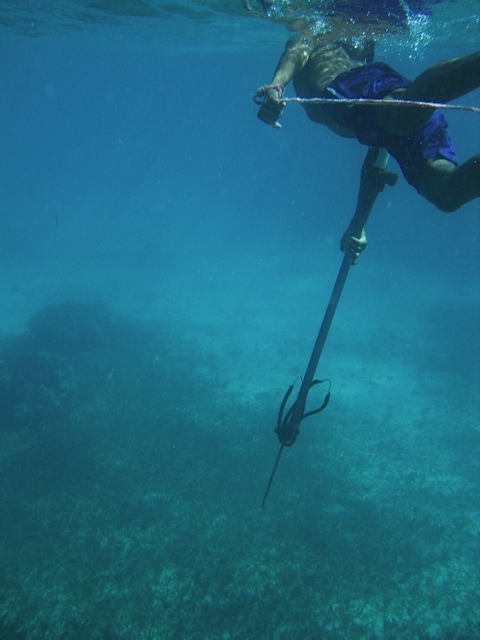 He dived down deep, twisting & turning upside down to look underneath rocks and coral in search of lobster. Crazy, but quite successful. He caught three nice sized lobsters, each time handing them to me. 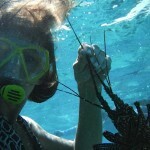 None of the other snorkelers wanted to hold them. In fact, they were very spiny and hurt my hand a bit, but the novelty of holding a freshly caught lobster won over pain in my fingers. 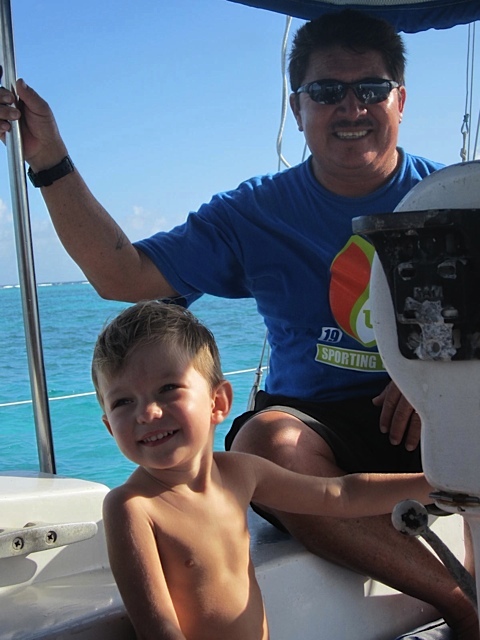 He also caught a conch – which is a tropical mollusk in a beautiful spiral shell. After our second stop, it was time for lunch: a delicious spread with fresh snapper in a tomato, mayo, mustard sauce, coconut rice, cucumbers, tomato slices, and flour tortillas. Everything tasted so good, we went back for seconds. 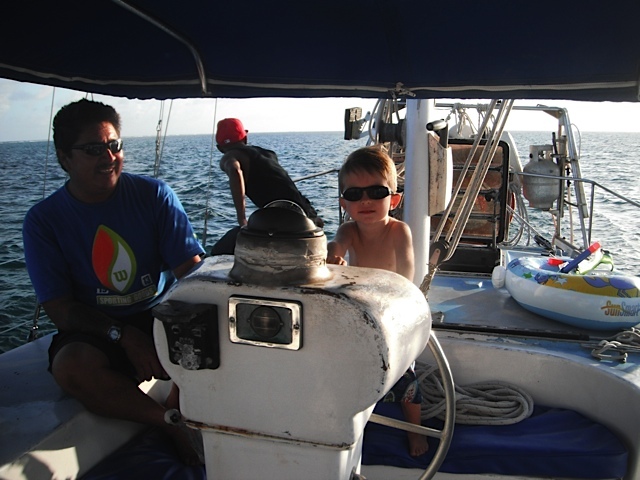 We also had some conch ceviche from the conch that Giovanni caught – talk about fresh! 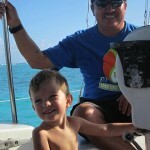 Oh, and did we mention that we had an endless supply of Rum Punch for the whole trip! A refreshing drink made of, you guessed it, local rum and fruit punch. At first, Giovanni was serving us drinks when we asked, but towards the end of our trip we were helping ourselves. After stuffing ourselves, a nap would have been nice, but on to our next stop. 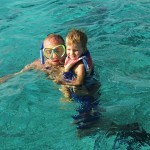 So, does taking a 3 year old and 1 year old into the ocean to swim with sharks sound like a bad idea? 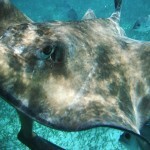 Our third stop was the infamous Shark Ray Alley, where the opportunity to swim with sharks and stingrays beckons . 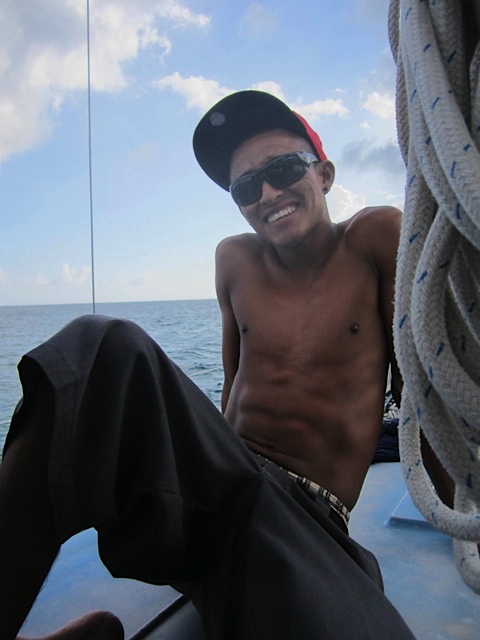 Giovanni prepared sardines for us to feed to the sharks. I don’t think the sardines touched the water before they were gobbled up by the sharks. And we were going to swim with these? Yes. 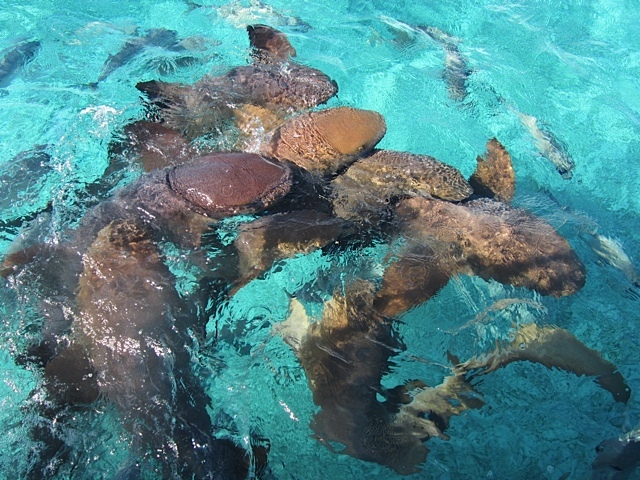 These were nurse sharks. They are bottom feeders and don’t care to eat humans, so we felt perfectly safe. 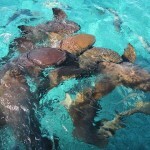 Swimming among the nurse sharks was incredible. They are strong, yet gentle giants. 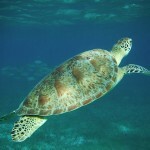 I watched them rest on the bottom of the ocean before swimming up to them to take some photos. We were even able to pet them. Their skin felt gritty, like wet sand paper. 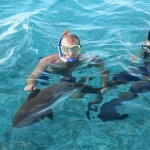 K even held one, and G was able to pet them as well and get in the water with them. 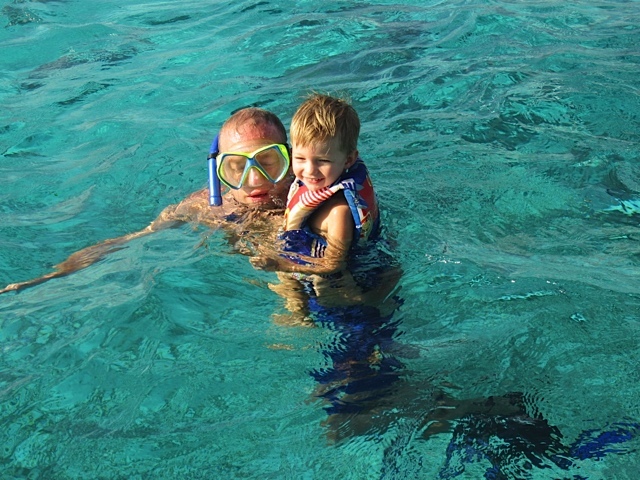 I was very proud of 3 yr old G for wanting to swim with the sharks! We also were able to pet and swim with Southern Stingrays. They were very friendly and do have some sharp barbs on their tails but not poisonous. 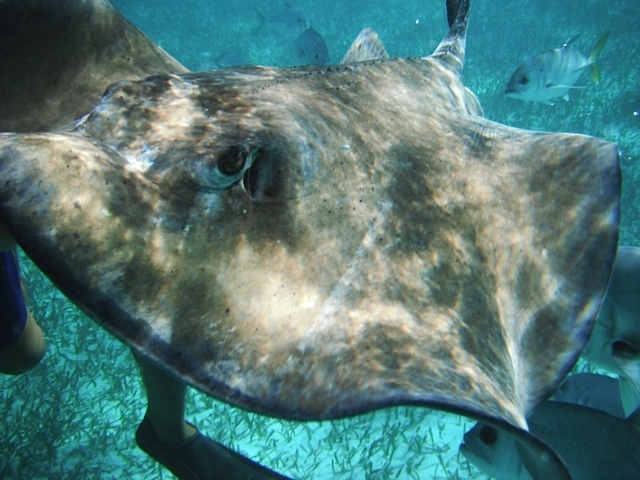 The sting rays were more slimy than the sharks, but smooth and slippery. I loved watching them flow through the water. They are such interesting looking creatures. 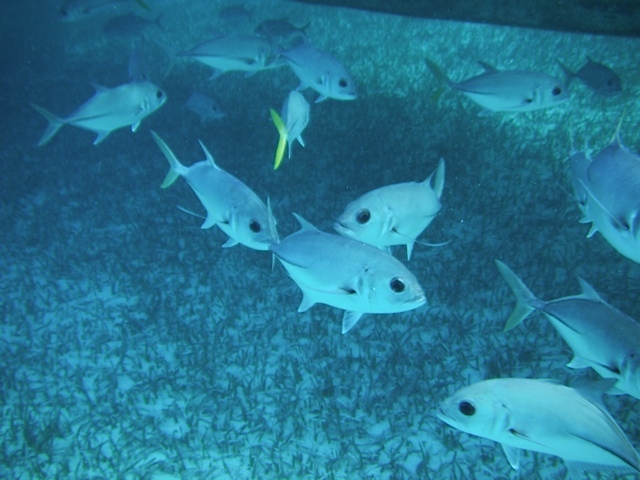 They are also bottom feeders and were going after any fish that might have been missed by the sharks and the hundreds of Jack fish, which are in the background of the picture below. Problems with a fogged up snorkel mask? Simply grab a piece of seaweed and rub the inside and outside of your mask with it. Fog is gone and stays gone. Would we go again? Most Definitely! Swimming in this azure underwater paradise was a welcome change from the weeks we’ve had of moving, adjusting to our new home, and finding our bearings. We enjoyed this day to the fullest! 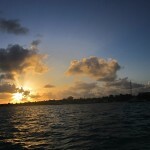 We plan on taking advantage of every opporutnity we get to kayak or boat and be awed by this underworld. 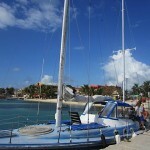 The water was so clear, the marine life so abundant and the rum punch so good! 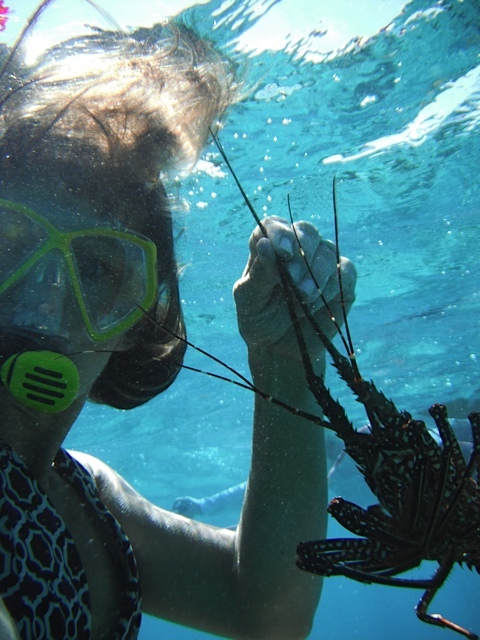 This would be on our list of MUST DO in Belize, for sure! 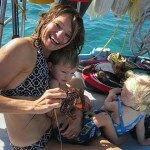 S holding a fresh, prickly lobster.